Clinical history: A 19 year-old male presents with limited range of motion of the knee 8 months following anterior cruciate ligament (ACL) reconstruction and a transtibial pullout repair of the posterior root of the lateral meniscus. Sagittal T2-weighted (1A) and T1-weighted (1B) images through the ACL graft and a coronal oblique proton density-weighted (1C) image anterior to the ACL graft are provided. What are the findings? What is your diagnosis? 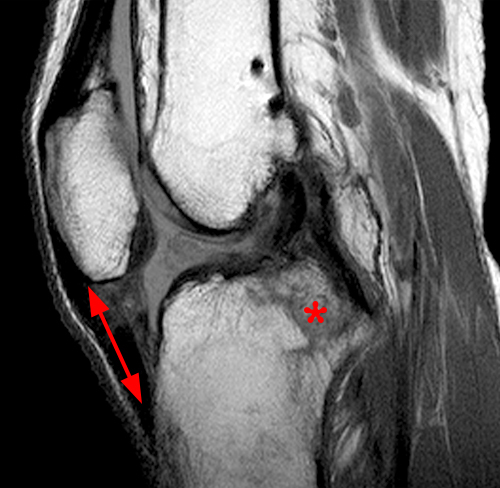 (2A) The T2-weighted sagittal image demonstrates a nodular heterogeneously low signal mass (arrow) at the anterior margin of the ACL graft. A band of low signal extends over the posterior aspect of the infrapatellar fat pad (short arrows). The tract of the transtibial pullout repair extends obliquely through the tibia (arrowheads). Mild low-signal thickening (arrowhead) is present posterior to the ACL graft, overlying the reattached posterior root of the lateral meniscus. (2B) On the T1-weighted sagittal image, the nodular focus anterior to the ACL (arrow) is heterogeneous but almost isointense to the joint fluid and articular cartilage with subtle central areas of reduced signal. Similar signal characteristics are noted at the posterior margin of the infrapatellar fat pad. (2C) The oblique proton density-weighted image again demonstrates the mass (arrow) anterior to the inferior portion of the central femoral trochlea. Arthrofibrosis of the knee with a cyclops lesion anterior to the ACL graft, fibrosis of the anterior interval, and posterior pericapsular fibrosis. In the knee, arthrofibrosis most often occurs following anterior cruciate ligament reconstruction and total knee arthroplasty and represents a potentially devastating complication. Clinical evaluation is the mainstay in establishing the diagnosis of arthrofibrosis, however MRI plays an important role in establishing the extent of involvement by fibrosis and to exclude other complications that may have a similar clinical presentation. Both true and cyclopoid types are simply referred to as cyclops lesions, and they are usually indistinguishable by MRI. MRI has an accuracy of 85% in detecting cyclops lesions increasing to over 90% for lesions measuring greater than 1 cm.8 Cyclops lesions are typically small and measure 10-15mm in diameter.8 However, significantly larger lesions may be encountered (Figure 3). 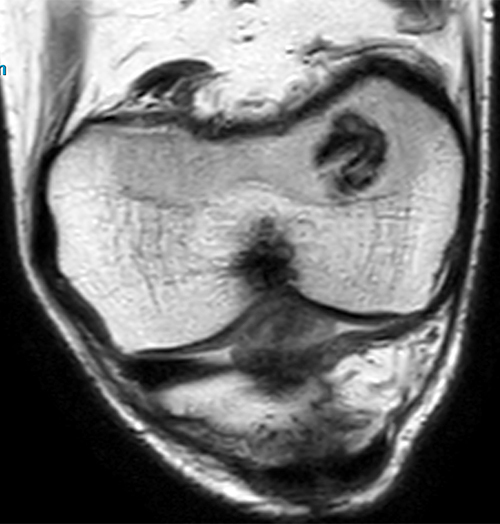 On MRI, cyclops lesions are adherent to the ACL graft and are hypointense or isointense to muscle on T1-weighted images and variable in signal intensity on proton density- and T2-weighted images.4 Rarely, areas of ossification within the cyclops lesion are well formed and large enough to be detected on MRI as circumscribed foci with internal signal that mirrors marrow fat signal on T1-weighted and fluid-sensitive sequences (Figure 4). An 18 year-old female college athlete presents 6 months following ACL reconstruction with locking and catching. Sagittal fat-suppressed proton density-weighted (3A), sagittal T1-weighted (3B), and axial proton density-weighted images demonstrate a large heterogeneous cyclops lesion (arrows) anterior to the ACL graft. A 32 year-old male 3 years post-ACL reconstruction with anteromedial knee pain. Sagittal T2-weighted and T1-weighted images demonstrate a cyclops lesion anterior to the ACL graft (arrows) containing an ossified focus (arrowheads) compatible with a hard cyclops lesion. A 28 year-old male 5 years after ACL reconstruction presents with limited mobility. Sagittal T2-weighted image demonstrates Blumensaat’s line (red line) posterior to the tibial tunnel opening at the tibia (oval) compatible with roof impingement. A 66 year-old female 10 years post ACL reconstruction with intermittent locking. Sagittal T2-weighted (5A) and axial fat-suppressed proton density-weighted (5B) images demonstrate a 5 mm intra-articular chondral body (arrows) surrounded by joint fluid anterior to the ACL graft. A focus of soft tissue thickening is compatible with a small cyclops lesion anterior to the graft (arrowhead). A 17 year-old male 1 year after ACL reconstruction, felt a pop while stepping into a hole with swelling and limited extension at the knee. Sequential sagittal proton-density weighted images demonstrate loss of ligament tissue anteriorly (arrowheads) within the intercondylar notch compatible with a partial tear. Torn anterior ACL graft fibers remain continuous with the graft in the tibial tunnel and are folded anteriorly (arrows) resulting in a pseudocyclops lesion. An 18 year-old female 5 months after ACL reconstruction with pain and diminished range of motion. A sagittal proton density-weighted image demonstrates a diffuse fibrotic reaction encasing the ACL graft with a cyclops lesion anterior to the ACL graft (arrow) and fibrosis posterior to the ACL graft (asterisk) extending to the posterior capsule. Also noted is fibrosis within the infrapatellar fat pad (arrowheads). Excessive fibrosis of the infrapatellar fat pad can result in altered biomechanics of the anterior knee. Various terms have been used to describe this pathology including infrapatellar contracture syndrome, synovial fibrosis of the infrapatellar fat pad, scarring of the anterior interval, and patella infera syndrome.12,15,16 Postoperative scarring normally appears as thin linear or spiculated regions of low signal on all sequences with small slightly thickened and more nodular portions found along the route of the arthroscopic portals and at the posterior margin of the fat pad (Figure 9).16 In contrast, symptomatic fibrosis results from more extensive fibrotic changes appearing as thickened and irregular areas of low signal on all sequences, which can greatly reduce the amount of normal fat. Sagittal proton density-weighted images demonstrate the normal appearance of the infrapatellar fat pad on the left and the typical mild post-surgical scarring following ACL reconstruction (arrowheads) on the right. A 15 year-old female who is 4 months post ACL reconstruction with knee pain and stiffness. Sequential sagittal T2-weighted images demonstrate a thickened band of fibrosis along the anterior interval of the knee (arrows). In severe cases of infrapatellar fat pad arthrofibrosis, fibrosis between the patella, patellar tendon, and tibia can result in severe retraction and tethering of the patella leading to patella baja which may become progressive (patella infera). Extracapsular fibrosis may also be seen. This can be a particularly devastating complication that can rapidly lead to osteoarthrosis at the patellofemoral joint if left untreated. Calcification of the fat pad may be present and visible on plain radiographs.1 The MRI findings include severe scarring in the infrapatellar fat pad and progressive patella baja. The development of patella baja is made more apparent by comparing current and prior studies by plain film or MRI (Figure 11). 48 year-old male with sagittal T1-weighted images at the time of the ACL tear (11A) and 2 years later after a fall (11B) demonstrates the development of severe scarring within the infrapatellar fat pad and posterior to the patellar tendon with interval inferior displacement of the patella. Incidentally noted is a hemarthrosis (11B) (with joint fluid appearing hyperintense to muscle) associated with an intra-articular fracture of the posterior tibia (asterisk). A 56 year-old female 1 year after TKA with pain and stiffness. The coronal T2-weighted image demonstrates diffuse heterogenous low signal fibrosis in the medial and lateral gutters (arrows). Focal areas of fibrosis following TKA are often seen in the peripatellar region and can present with mechanical symptoms. On MRI, nodular or band-like synovial thickening or intra-articular masses demonstrate low to intermediate signal on proton-density and T2-weighted images (Figure 13). A 60 year-old male 4 years post TKA complains of pain and popping of the knee with walking for the last 6 weeks. On the sagittal inversion recovery image (13A) an abnormal low signal focus is noted posterior to the patella (arrowhead). The axial proton density-weighted image (13B) reveals this structure to be a band-like region of arthrofibrosis (arrowheads) passing posterior to the patella and blending with the synovium medial and lateral to the patella, likely contributing to the patient’s mechanical symptoms. Patellar clunk syndrome results from localized fibrous tissue forming at the quadriceps insertion on the proximal pole of the patella and can be seen in up to 3.5% of posterior-stabilized TKAs.23 Patients present with a locking sensation or decreased motion during flexion and extension.17 An audible clunk may be observed on physical exam when the knee is extended from the flexed position, presumably from entrapment of the tissue in the intercondylar notch with flexion and abrupt displacement with extension (Figure 14). A 40 year-old female who underwent revision TKA 1 year prior presents with catching and locking symptoms anteriorly when going from 90 degrees of flexion to full extension. A sagittal T2-weighted image demonstrates prominent peripatellar scarring in the infrapatellar fat pad (asterisk) and above the patella with a nodular component extending inferiorly at the posterior margin of the superior patella (arrows). The appearance and clinical history are suggestive of patellar clunk syndrome. Concerns of emerging arthrofibrosis should be raised if physical therapy fails to achieve expected range of motion targets following surgery. Initially, a more aggressive physical therapy regimen is attempted along with anti-inflammatory medications. Assessment of the type of deficit is important in directing the therapeutic approach. Splinting or bracing may be used for extension deficits. Arthrofibrosis is a common complication of ACL reconstruction and total knee arthroplasty and can result in a frustrating clinical course and poor functional results. MRI is effective as a tool to evaluate unexplained pain, limited range of motion, and functional limitation in the postoperative patient in whom arthrofibrosis is suspected. MRI can confirm and define the extent of a suspected fibrotic lesion and assist in detecting and differentiating other postoperative complications with a similar clinical presentation.